Earlier this month, Interserve went into administration. Its shares have been rendered worthless and the company is now owned by its former lenders. I may be stating the obvious, but this is not a good outcome for Interserve’s shareholders. So how did it all go so very wrong for Interserve, when just a few years ago it was riding high with a steadily growing dividend and a market cap of almost £1 billion? In my opinion there were four main problems, which to varying degrees were also to blame for similar collapses at both Capita and Carillion. Personally, I’m not a fan of companies that do lots of largely unrelated things. I think companies should do one thing and do it very well. For example, Unilever may have 400 or so brands, but in most cases the underlying business model and skills required are basically identical (build a brand through advertising and then ship lots of small repeat-purchase items across the globe using the company’s enormous supply chain). In Interserve’s case, I don’t think the business model or basic skills required for cleaning, home care, building energy from waste plants or designing shopping malls in Dubai are remotely the same. Now, on its own, this lack of focus isn’t why Interserve went bust. But it is an important piece of the puzzle because it made Interserve harder to manage. For some companies that isn’t really a problem because their core business is so robust you could put any idiot in charge and they’d still make a profit. But other companies, like Interserve, have very little margin for error. In other words, they have very little margin of safety because their profit margins are wafer thin. 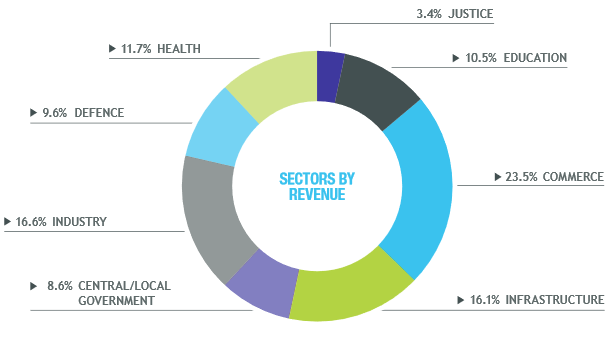 In the ten years leading up to 2014 (when the company was still very much on the up), Interserve generated average net (post-tax) profits of £56 million from average revenues of £1932 million. That’s a net profit margin of just 2.9%, which is extremely thin. This is a problem because a company’s profit margins are effectively a kind of margin of safety. For example, if a company has net profit margins of 20%, then there’s a reasonable amount of room for income to go down or expenses to go up before profits are wiped out. So companies with wide profit margins have a wide margin of safety, at least as far as income and expenses are concerned. But if a company has margins of less than say 5%, then relatively minor movements in income or expenses can see those profits wiped out. In other words, the margin of safety is thin. I offer you £10 to walk along a plank of wood from one end to the other. The plank is suspended one foot from the ground, it’s 20 feet long and four feet wide. Do you take the bet? I think most people would take that bet because the margin of safety is wide, just like the plank. Even if there was a sudden gust of wind (i.e. an unexpected and negative external factor), or if you’d had to much to drink at lunchtime (i.e. a negative internal factor driven by your own bad judgement) you could still probably walk 20 feet along a four foot wide plank and win the £10. I offer you another £10 to walk the plank, but this time the plank is only one foot wide. Do you take the bet? This is obviously harder, but it isn’t really hard. However, it would take some degree of skill, especially if it was windy. The margin of safety is smaller, small errors are more likely to result in failure, so the skill (or luck) required to successfully complete the task is higher. I offer you another £10 to walk the plank, but this time the plank is just two inches wide. Do you take the bet? Now this really is quite hard. If you take the bet there’s a good chance you won’t get all the way across. There’s also a good chance you’ll fall over and possibly injure yourself. The margin of safety is now tiny. Even the slightest breeze or wobble will probably see you fail, and if its really windy your chances of success would be virtually zero. Managing Interserve, with its long history of sub-5% profit margins, was like taking on the third bet. Success was possible, but it would take someone with real skill, a bit of luck and a benign environment (i.e. no sudden gusts of wind) to pull it off. Unfortunately it seems as if Interserve fell short on all three. 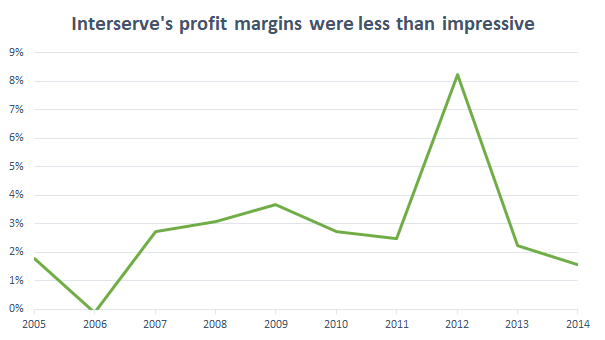 Thin profit margins make a companies harder to manage, riskier and leave very little margin for error. Given that situation, the obvious thing to not do is use debt to boost returns. That’s just plain common sense, isn’t it? Perhaps not. It seems that the managers of many of these thin profit margin companies get fed up with their weedy profits and feeble returns on shareholder capital, so they load the company up to the eyeballs with borrowed funds as a way to juice up returns and keep shareholders happy. But debt amplifies risk as well as returns, and when its layered on top of a company with thin margins (of safety and profit), things can get very ugly very quickly. To make things more exciting, I offer to give you £1 million if you walk across a 20 foot long plank, which is still two inches wide but is now 100 feet off the ground. The margin of safety is still as narrow as before (the plank is the same two inches wide) but now it’s 100 feet off the floor. The potential returns are a lot higher (£1 million) for basically the same amount of work (a 20 foot walk along a two inch wide plank) but the risks are much, much higher. If you make a mistake or if there’s a gust of wind, you’ll probably fall to your death. This is what happens when thin margin companies take on massive amounts of debt, or financial leverage. The potential returns are higher, but if it goes wrong it goes spectacularly wrong. 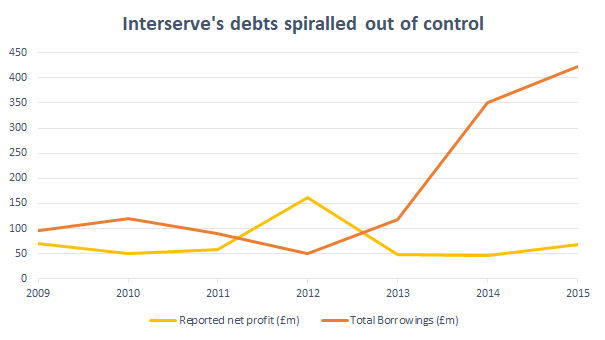 So why would a company like Interserve take on lots of debt? There are lots of reasons, but ultimately it’s some combination of overconfidence and incompetence. In this case, Interserve’s management set a target to double earnings per share in the five years to 2015 (as mentioned in this interesting interview with Interserve’s CEO). Doubling earnings in five years is a massively difficult task for a large and mature company, especially one in such competitive markets as construction and support services. The key driver of growth was acquisitions, and Interserve spent more than £300 million buying other companies between 2012 and 2014. This was mostly paid for with borrowed money, which helped drive the company’s borrowings from a very reasonable £50 million in 2012 to more than £400 million in 2015. Throughout this period, Interserve produced annual net profits of around £60 million. So with borrowings of £50 million in 2012, that was a very reasonable one-times profits. But by 2015 its debts were more than seven-times its average profits, which I think is far too much for a company operating in relatively cyclical sectors. In some cases, this sort of leverage is excusable. If the company has wide profit margins and predictable sales and costs (i.e. if the plank is four feet wide) then a bit more leverage isn’t necessarily a problem because the company’s unlikely to make a loss (i.e. fall off such a wide plank) and therefore unlikely to struggle to pay its debts. But if the margin of safety is thin (if the plank is narrow) then it is reckless in the extreme to take on lots of debt. In the same way, walking 20 feet across a two inch wide plank that’s 100 feet off the ground is incredibly risky. If you’re going to pull it off you need to be very brave, very skilled and very lucky. And if a company with little margin of safety and lots of financial leverage wants to be successful, it needs a very brave, very skilled and very lucky CEO… and those are few and far between (as Interserve’s demise shows). As if that wasn’t enough, Interserve also had a massive defined benefit pension plan, like Carillion and Capita before it. In 2016, just as things started to go really wrong, Interserve had pension obligations of just over £1000 million. With average annual profits of around £60 million, its defined benefit pension fund was almost 20-times the company’s profits. This is a colossal risk. If the pension fund had a 10% funding deficit, which is about average in the UK, there would be a £100 million funding gap, equal to about two years’ profit. In reality, Interserve’s funding gap was smaller than that, averaging around £50 million, with a lot of volatility from year to year. A £50 million funding gap may not seem like much for a company with £60 million annual profits. Just shovel all the profits into the pension fund for a year and hey presto, the deficit is gone. If only it were that simple. The problem with pension funds is that they tend to get bigger over time. For example, in 2011, Interserve’s pension obligations came to £695 million, but by 2016 they’d grown to £1045 million. That’s a £350 million increase, which is about what the company earned during that entire five-year period. Obviously companies can’t send every penny of profit into their pension fund as there would be nothing left for dividends, capital expenses or debt repayments. So rather than paying in every penny of profit, up until 2011 Interserve had been paying £23 million into its pension fund to close the deficit. This worked to some extent, and from 2011 onwards the pension trustees ordered the company to pay a smaller amount (a mere £12 million per year) into the fund. But that’s still a huge amount for a company earnings just £50-£60 million each year. And as its debts ramped up, interest payments increased to £23 million by 2015, dividends were increased to £36 million and deficit recovery payments remained at £12 million. Those three items alone come to a total cash outlay of £71 million, which was more than the company earned at the time. And just when it looked as if things couldn’t get any worse, the pension trustees demanded that deficit reduction payments be increased to at least £15 million for 2019 and beyond. This cash outlay on interest, dividends and the pension deficit was simply too much. In 2017 the dividend was suspended, but it was too little too late. Interserve’s cash income could not match its cash outgoings and so debt was used to plug the gap, leaving it with an insane £800 million debt pile by 2018. This is a sad story and raking Interserve over the coals gives me no joy. Despite the company’s shortcomings, I don’t think any of this was inevitable. 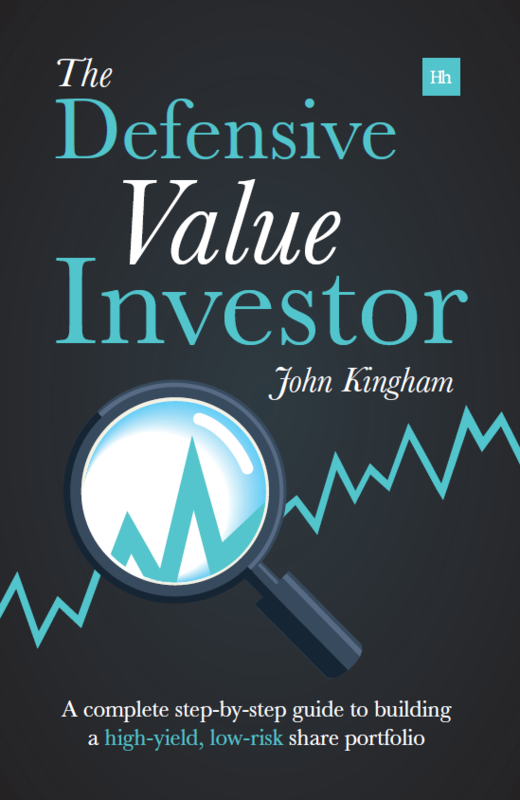 There are clear lessons, both for investors and directors. The various rules of thumb I’ve mention in this post-mortem should help, but they are aren’t perfect and I can’t guarantee that companies meeting these rules will be successful. Instead of looking for guarantees, think about probabilities. A company like Interserve, with diverse and unrelated operations, thin margins and lots of debt and pension liabilities, had very little probability of success unless it was run by a very lucky, very skilled, very brave CEO. On the other hand, companies that are highly focused, with fat margins and little or no debt and pension liabilities, have a much higher probability of long-term success and don’t require a very lucky, very skilled, very brave CEO (although completely incompetent and overoptimistic CEOs should still be avoided). So if you did lose money on Interserve, don’t despair. Even the investing greats occasionally lose money. Just make sure you learn the appropriate lessons and apply them to all your future investments. If you do that, then Interserve may turn out to be the best investment you ever made, because we learn much more from failure than we do from success. 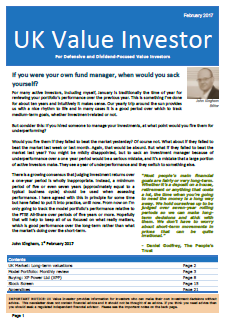 What went wrong from an investor’s point of view? John, Trite statement I know, but buying shares in a company like this from the get go I suppose? Hi LR, well that’s hopefully what my article is going to fix, or at least help investor get out a little earlier, i.e. before the thing goes to zero. Interserve actually used to be a reasonably well-run company, even with those thin margins. It just all just went very wrong when management decided to set a target of 100% EPS growth between 2010 and 2015. It wasn’t realistic (in my opinion) and led to big acquisitions funded by big debts. Plus they kept growing the dividend, which didn’t help when added to the pension cash drain. In fact, I used to own shares in Interserve, but pre-2013 when the balance sheet was much more sensible. I sold out because investors loved the aggressive expansion plans so the share price shot up, and that was my cue to head for the exit. Aah the big debts, I think we are all learning about those. It quite frequently ends badly doesn’t it? Incidentally, now that it looks like the UK has been defeated in war and will become a subservient rule taker and a vassal state of the EU, have you pondered on the impact of any of the UK stocks, or sectors, and what it might mean? I have been working towards a lot of my portfolio having less exposure to UK earnings and also EU earnings, as the growth and debt trajectory is far worse in the EU than much of the rest of the world. This isn’t meant to be a political statement, even though it might sound that way, but it is a fact that the political class has stupidly boxed the country into that corner and we as investors need to be savvy and work out how it might have an impact. Also the serious potential demise of the Tory party opens the door for a Corbyn government, another area of consideration. PS: I bit the bullet and offloaded Centrica – your article kind of help jolt me over the line lol ! I don’t really pay much attention to macro factors. My basic position is to be diversified by geography (< 50% portfolio revenues from UK) and sector (no more than ~15% in any one sector) at all times, which hopefully insulates the portfolio to a reasonable extent from all but the most catastrophic macro outcomes. John – you have not mentioned the energy from waste mess up. They decided to use an untried technology via a subcontractor and guarantee it. The technology did not work and a £72 million liability (figure dimly remembered but right order of magnitude). The subcontractor went bust. Add that to the mix described above & you can see the problem. Actually I deliberately avoided that topic as it’s been covered elsewhere and I see it more as the straw that broke the camel’s back. Sticking with the camel analogy, the four factors I mentioned had effectively loaded the camel up with hundreds of kilos of baggage, and any minor additional baggage (in this case the energy from waste debacle) would be enough to break the camel’s back. Thanks for the article. It basically confirms my understanding of what went wrong. Energy from waste should be straightforward. You burn the rubbish, heat water & make steam to turn a turbine & generate electricity. Theoretically you can increase the efficiency by pyrolysing (heating in the absence of oxygen) the waste and burning the gases released. It works in theory but the waste feedstock is too variable because you have no control over what people throw away. So, as your article says, they were taking on something they did not understand. Many thanks again for illustrating how poor the management was in other respects. I own shares in Pennon because I quite like the Energy from Waste story. I think the market has undervalued it. There are risks but if they can keep doing it right there is a lot of money there. If they can run district heating schemes from the waste hot water they produce – even better. You can buy in cheap at the moment because of the political risk of a Corbyn govt and Pennon is a water company as well. Thanks again for your interserve analysis. I remember some articles in the news about Interserv after Carillion folded. The management of Interserv insisted they did not suffer from similar problems. In hindsight that seems like a desperate lie. What other UK companies are zombies? If we apply the rules of thumb in this article, what proportion of companies are burdened by debt and pension obligations yet pay dividends that are unsustainable? It’s a good question. Unfortunately, bulk data on pension liabilities isn’t available, so analysing that has to be done by hand. My hunch is that there aren’t huge numbers of companies like this, and most of them are lumped in the same sectors; support services and construction being the obvious ones. My personal bugbear is the payment of dividends when a company is on the brink of an existential cash crisis. In most cases it’s weak management, scared of cutting or suspending the dividend in case they lose their job (either that or their bonus is linked to dividend growth).